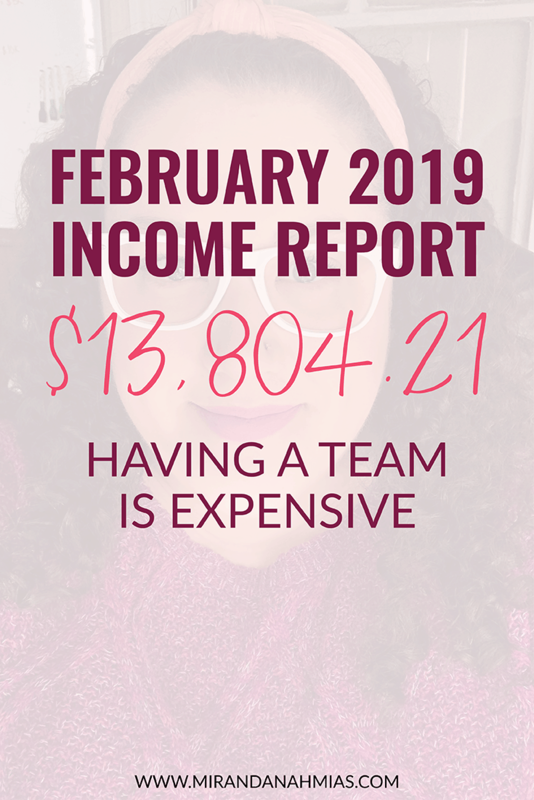 Let’s jump right in with this February 2019 income report! I’m super excited to share with you guys what’s been going on with me lately. February was a little bit of a whirlwind. In a shockingly spontaneous decision (I’m not a super spontaneous person and my husband definitely isn’t), we decided to put our house on the market! I was hoping to get a lot of work done on many different things in my business, but…it just didn’t happen. We listed our house and it gained so much interest that we had to then jump into doing an open house, and literally within the span of a week, we were moving out. We scheduled the movers and suddenly we were in our new apartment! If you’ve been following along on Instagram (check out my Story highlights), you can see a sneak peek of the new place. 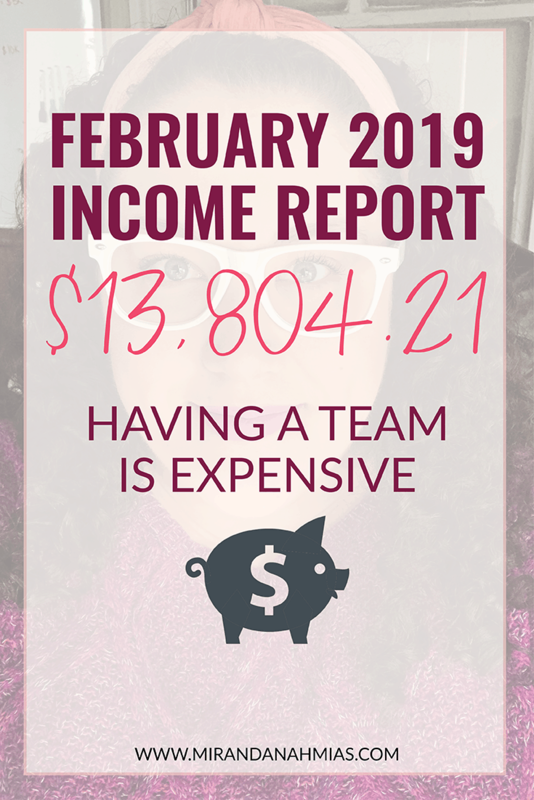 Because things were so crazy, so much didn’t happen this month and it was kind of a whomp whomp follow up to our crazy $20k month in January. But I don’t really care what it “looks like” — or at least I’m trying not to. I just have to remember that these kinds of things happen to everyone! Stuff happens. Other stuff doesn’t. Put our house on the market — It just so happened to be a really good time to sell, and my dad has an apartment that he needed to fill. We decided to move into the apartment, which will help us save some money so that in a few years we can move into our long-term dream house. Valentine’s Day — Valentine’s Day is my favorite holiday, so it’s always fun for me to celebrate. Plus, it’s the 4 year anniversary of Brent and I getting engaged! We have a long-standing tradition that Brent cooks for me on Valentine’s Day. This year he made salmon and twice-baked potatoes. Finished switching to S-Corp and going on payroll — This was a LONG time coming. We’ve literally been working on this since June, and we finally made the switch throughout January and February. Now, Brent and I are both officially on payroll! Grandfather launch of PPP — This happened during the last week of January and ran a little bit into February. 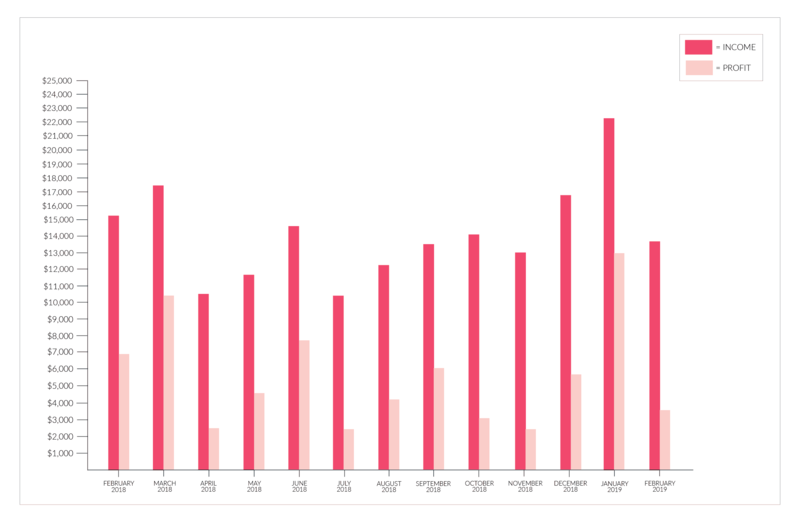 We ended up selling 16 packages in 8 days, and hit a total of 50 current Pinterest clients! Decided to cut down on the number of clients I have + raise my rates — This was a big one for me. Firstly, I haven’t raised my rates in like 1.5 years, so that was a big change. And it’s also been a bit of a mindset shift. I’m still getting used to it! I had a meeting with one of my current clients and it totally changed how I was thinking about things. I decided that I want to spend more time working with a handful of my favorite clients and serve the rest with our package-based services. Plus still have students! My business model is kind of weird, but I’m digging it. And I love to watch it change and grow as time goes on. My Goals For February 2019: Success or Failure? Start running Facebook ads for my Perfect Pinterest Package. — FAILURE. I didn’t quite get to this one yet, but they will definitely be up soon! Make $6,500 from social media packages. — SUCCESS! Wow we did really good on this! I was expecting this number to not be quite this high, since we are coming down from our sale we ran at the end of January. But nope, our packages are doing awesome and pulling in the lion’s share of the revenue this month! Prepare and schedule 6 newsletters + 6 blog posts. — FAILURE. I had a really good start in January, but then kind of ran out of steam. Right now I’m super behind! Add 5+ new things to my Systemize + Scale program — FAILURE. Just haven’t had time to focus on this. My Goals for March 2019— Let’s Do This! 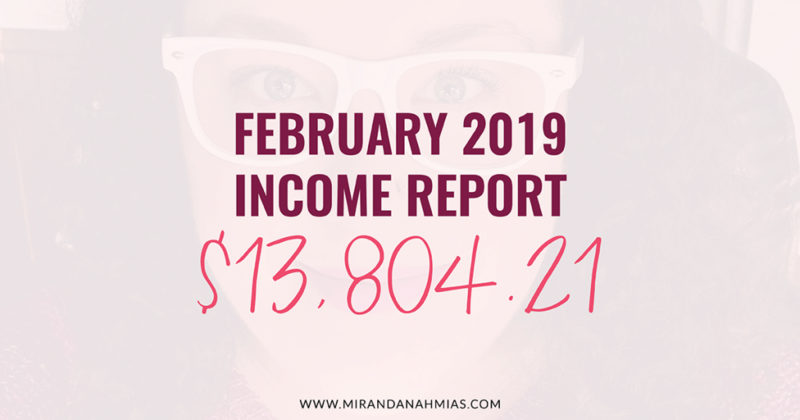 February 2019 Income Report: All the Stats & Analytics! Phew! That is a LOT of dough spent on my team. This is something that I really wanted to touch base on, because I’ve felt like my team payments have been slowly increasing lately, and this month, in particular, they were super high! Part of this is because I am delegating more so that I have more time to spend on my own business, which is actually a good thing. But the other part of it is that I’ve been getting a lot more custom sales funnel clients, which requires a lot more delegation (but the return on investment is good). And then things end up looking out of whack where we made a TON of income last month, partly because I sold a new custom sales funnel package, but then all the actual work was done this month, which ends up not looking so good on paper! Overall, I’m really happy with where my business is right now and while I’m always trying to lower expenses, my team is the best possible way to spend money. I don’t regret it one bit! And when it evens out, we’re still making enough to keep the lights on (plus some), so it’s all good! Right now, I’m in an interesting spot in my business where I am trying to get everything set up so that I can scale certain elements a lot more, but I’m also trying to cut back in other areas. I think this has a lot to do with why my team costs are so high — more project management, more delegation…but I am confident that in the end, it will be so, so worth it.